As light continues to advance on the Creator's ordained method of time-keeping, the luni-solar calendar, so also does the opposition to this truth. As soon as one objection is answered, another is introduced in its place. One objection, in particular, that is frequently offered by those who have not honestly taken the time to thoroughly study this most important topic is the Biblical narrative of the manna. Some use Scripture's silence about how manna was to relate to New Moon Days and the 30th day of the month as a "proof" that the Lunar Sabbath is not Scriptural. "Exodus 16 states that manna was to fall only on the six work days, but never on the Seventh-Day Sabbath. There is no mention of the manna in relation to New Moon Day or the 30th day of the month. Therefore, the Israelites must have been observing continuous cycling weeks, the same as we do today." While it is true that Exodus 16 does not provide details of how the manna was to relate to New Moon Day or the 30th day of the month1, Scripture is not entirely silent on the matter. It has been assumed by many that the children of Israel ate only manna for forty years. This, however, is simply not true. When pharaoh finally agreed to let Israel go free, he sent them away with all of their flocks and their herds. While we cannot know with certainty the exact number of livestock that the children of Israel took with them, we can safely conclude that they must have numbered at least in the hundreds of thousands because there were 600,000 men, besides women and children, that left Egypt in the exodus (Exodus 12:37). The exodus was no small movement! The children of Israel had been greatly blessed by Yahuwah during their stay in Egypt. The fact that Israel was blessed with olive oil and flour during their stay in the wilderness can also be seen in Yahuwah's command regarding the tabernacle's lamps and the showbread that was to continually remain before Him. 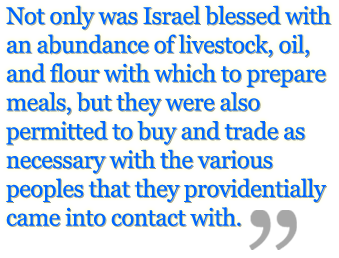 Not only was Israel blessed with an abundance of livestock, oil, and flour with which to prepare meals, but they were also permitted to buy and trade as necessary with the various peoples that they providentially came into contact with. This is clearly seen in Yahuwah's command to Moses when the children of Israel were preparing to pass through Seir in the land of Esau. Many have mistakenly taken Israel's complaint about the manna in Numbers 11 to mean that they were only permitted to eat manna. Israel's complaining that "there is nothing at all except this manna" was clearly an exaggeration and was a reflection of their lust for excessive flesh meats and the luxuries that many of them had enjoyed in Egypt. We must remember, here, that many Egyptians joined themselves with Israel during their exodus from the land of Egypt. It was likely the Egyptians that joined themselves to Israel who were doing most of the complaining here, obstinately crying out for their former food staples. Manna was clearly not the only food available to Israel during their stay in the wilderness. This is further attested to by the fact that the manna was not even given until Israel's second month in the wilderness. What were the children of Israel eating during their first month in the wilderness? They were eating from their abundance of livestock, as well as from the provisions acquired when they plundered the Egyptians. What, then, was the point of the manna if it was not to feed Israel? 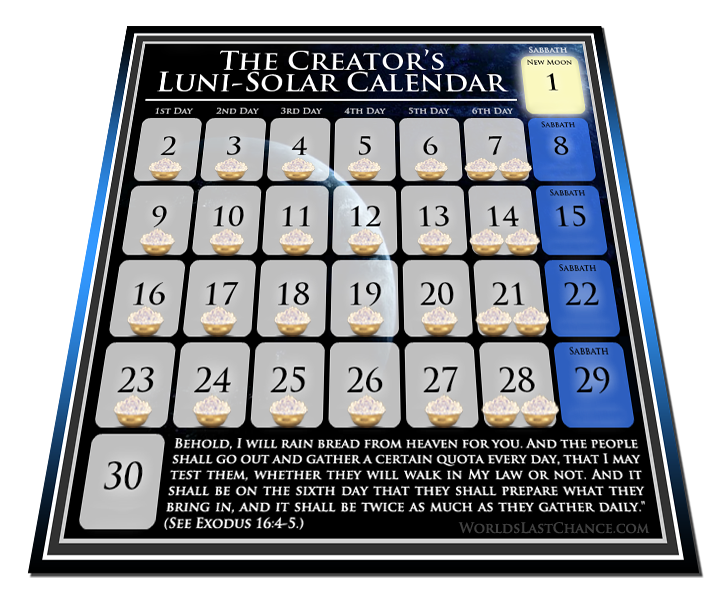 The primary purpose of the manna was to teach Israel the mechanics of Yahuwah's celestial calendar, which was established and ordained at Creation. Manna likely did not fall on New Moon Days or on the 30th day of the month because it was not at all necessary. The children of Israel were blessed with an abundance of resources, and had plenty to eat, apart from the heavenly manna. This would explain why cooking was not forbidden on these days. 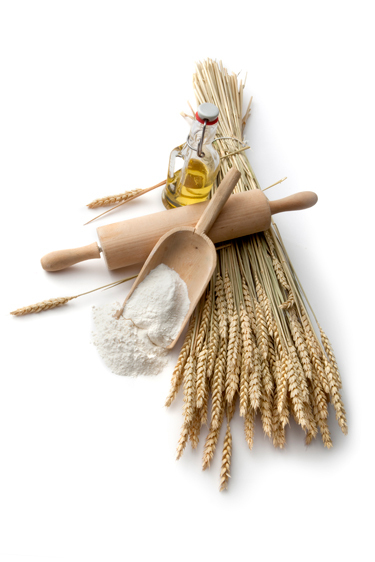 The purpose of the manna was to make clear how the Sabbath Days were to be reckoned. 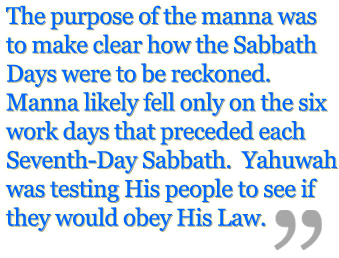 Manna likely fell only on the six work days that preceded each Seventh-Day Sabbath. Yahuwah was testing His people to see if they would obey His Law. Yahuwah, in His great mercy and infinite wisdom, was teaching Israel what they had spent 400 years forgetting, His calendar! Today, our loving Father is again restoring His calendar. He is testing those who profess to belong to Him to see if they will walk in His Law. Will you, today, join yourself to Yahuwah's faithful? Will you pledge your allegiance to Yahuwah, and commit to observing the holy days on His appointed calendar? 1 It is worth noting that Scripture does not provide details about how manna would relate to Feast Days, either. For example, there is no mention of whether or not the manna would fall on the Day of Atonement, which was to be a solemn day of fasting and no labor (Leviticus 23:27-32). This, however, does not prove that the Day of Atonement was not part of the Hebrew calendar! 2 Even considering the vast amount of required sacrifices and the regular consumption of the livestock by the children of Israel, it is likely that the number of livestock increased exponentially (as they had offspring) during Israel's stay in the wilderness. 3 See also Numbers, Chapters 28 & 29, for an extensive list of the prescribed sacrifices and offerings.